OK, my mad art skillz are again on display. My many, many years as a production designer are all about my ability to put on paper the thoughts I have in my head. Here is the concept for the hoverbikes. 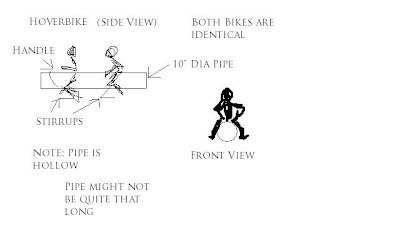 Basically, they're a piece of 10" tubing which you ride. The tube itself is hollow with only a couple stirrups (if necessary) to put your feet in, and a couple handles to operate with. Another option is that instead of motorbike handles, it just has a joystick for the operator. I kinda like that idea. It sounds cheap. The hoverbike sequence is the center set-piece of the whole dang movie. It better work.